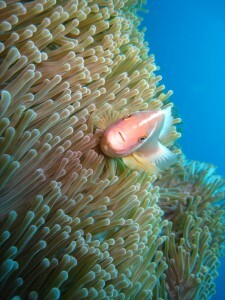 Enjoy the best dive site’s in Bali all year round. Read on for more detailed information about when to dive or click here to watch a quick one and a half minute video which showcases what we do – we hope you’ll join us! We are fortunate enough to have very healthy coral reefs and a huge variety of creatures, including Manta Rays, that live in and around them available to us for twelve months of the year. The visibility is nearly always good to excellent. Even in the rainy season from November to March, the water remains clear as there are no rivers on any of the three islands. Between the middle of July and the end of October we are incredibly lucky to have frequent sightings of the oceanic sunfish (Mola Mola). From the months of June to October the water can be cooler and a 5 mm wetsuit is advisable. 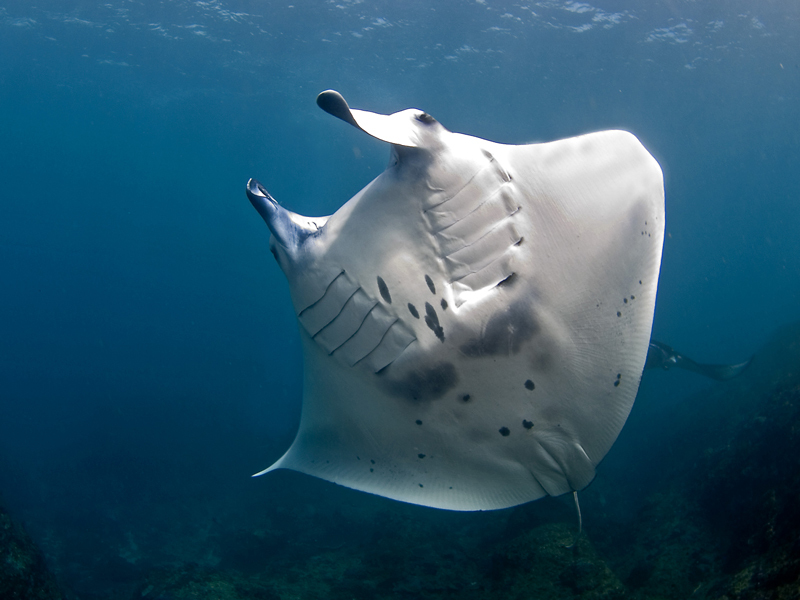 Manta Rays: All year round in the south of Nusa Penida. The Mantas tend to congregate around Batu Lumbung (Manta Point). This is a wild and remote area with dramatic sea cliffs rearing three hundred feet into the sky. As the Mantas swim close to the cliffs we dive here when the sea is calm to get the best conditions for sightings. The best time to see the Mola Mola is between the beginning of July and the end of October. There are sightings on either side of these months, but generally these are less frequent. Mola Mola can be seen at most of our dive sites, but Crystal Bay and Blue Corner are where they like to congregate! 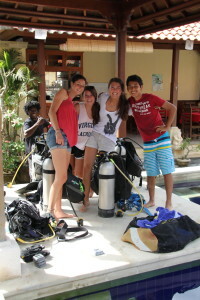 We run PADI courses throughout the year. We choose sites suitable for beginners to ensure that you have the best learning experience possible. If you would like to join us for a PADI course from August – October, we recommend booking early to avoid disappointment – these are the busiest months on Nusa Lembongan. Does rain affect my diving? Not at all. We do not have any fresh water rivers on Nusa Lembongan so when it rains there is no run-off from the island into the ocean (which can limit visibility). Our dive sites are unaffected by rain and you’re going to get wet anyway! Nusa Lembongan is a low lying island and has it’s own microclimate which has significantly less rain than mainland Bali. During the “wet season” rain usually falls in short showers. High Season and Low Season. 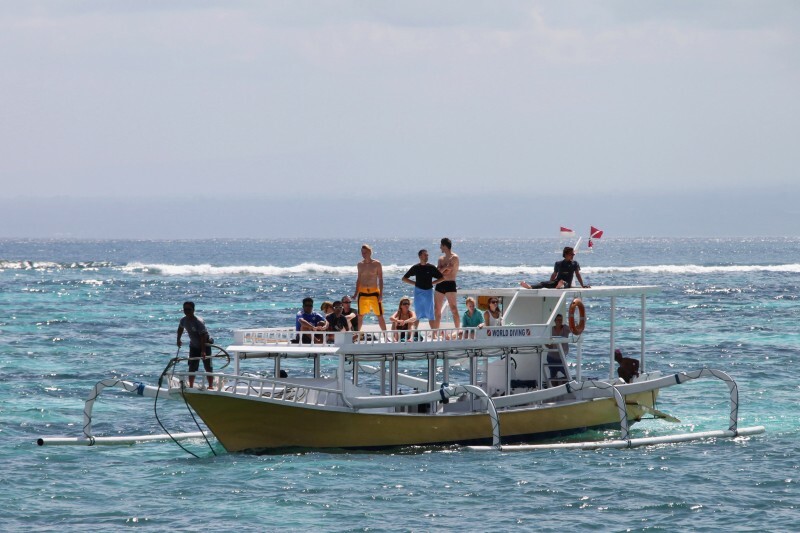 Nusa Lembongan is busiest from August to October so bookings for diving, boat transfers and accommodation should be made in advance. The quietest months are from February to May – this is also the time when water temperatures are at their warmest – a great time for beginners! Ask us about discounts for multiple days of diving and for professional divers, Divemaster and above. Check our discount diving and accommodation packages here. Book some dives with World Diving! Complete the form below to make an inquiry for fun dives or dive and stay packages with World Diving. Remember, to dive you should be in good physical health. Review the PADI Medical Statement to make sure that you are in good shape to dive. Click here for more information and a PDF version of this statement. If you want World Diving to take care of alternative accommodation as well (or one of our packages), you can make a reservation enquiry after completing this form. How many certified divers are in your group? Roughly, how many dives per person during your stay?